Halloween: For Halloween , Sofia was very busy. She took part in pumpkin carving and cookie decorating parties at the Montessori, a neighborhood Halloween party, and a trip to the South 47 Farm. 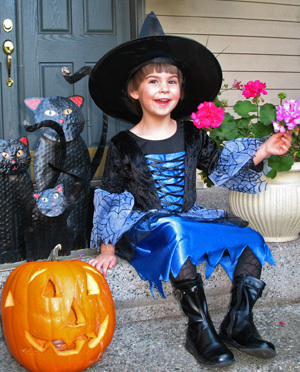 She anticipated the actual trick-or-treating for weeks and was a very cute witch on Halloween night. Sofia likes spiders and loved her witch costume with webs on it. Wedding weekend: The family spent the weekend of September 13th in Leavenworth celebrating the wedding of Amy's niece, Lyndsay. We stayed at the Enzian Inn in Leavenworth, and in later-summer weather enjoyed both its indoor and outdoor swimming pools, as well as the scenic 18-hole putting course just across the street. Both mornings we ate a buffet breakfast at the Inn, serenaded by an alphorn played by the Inn's owner atop the balcony rail outside the dining room. The wedding was just outside Leavenworth, in Plain. At the informal rehearsal dinner we watched a lengthy video of photos of both Lyndsay and her fiancé, Nolan. The wedding Saturday took place outside, and Lyndsay, as beautiful as the weather, arrived by horse-drawn carriage. After a service that was both humorous and meaningful, the guests walked to a nearby barn for dinner, speeches, and dancing. Jeff and Kyle were the highlight of the toasts, with a hilarious rap they wrote to honor their sister. The DJ was entertaining, the dancing was rigorous, and we were told later that the party continued long after we had to leave to get Sofia to bed. School begins again: Sofia returned to preschool on September 2nd. She was very excited, especially to be able to eat lunch at school. She liked choosing her own lunch box. Cameron began 11th grade on September 3rd (the 2nd was reserved for sophomores only). He was not excited to return, and he has a heavy load (AP English, AP European History, Physics, AP Calculus, French, two bands), but fortunately he seems to like all his teachers. Sofia is excited to have a lunch box for school.